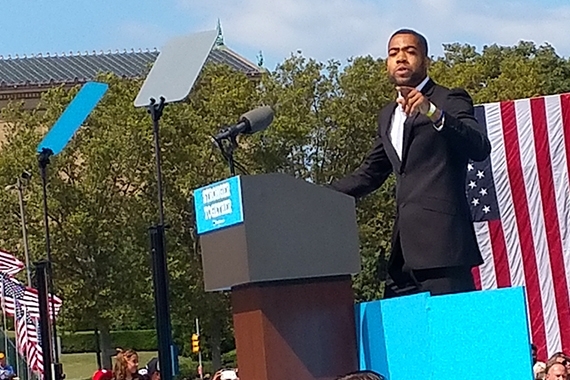 With the volume rising in his voice every few words, Swarthmore student Patrick Houston ‘17 emanated passion as he introduced the nation’s president at a Clinton rally in Philadelphia this week. You can watch him speak here. Patrick found himself with this opportunity due to efforts by members of Swatties for Hillary. Nate Urban ‘18, Senior Advisor of Swatties for Hillary and member of the Pennsylvania youth leadership council, was contacted by a campaign staff member whom he has worked with closely in the past. Urban was asked if he knew anyone deserving of a featured role in the rally who would do a good job with a such a special opportunity. He did not, however, know exactly what role this person would play. Houston’s mother died right after his birth, and his father died five years later. He grew up poor, but his many older siblings worked to ensure that he was fed, clothed, and had access to education. And at the age of 21, Houston obtained health care for the first time under Obamacare. Nate Urban and Patrick’s girlfriend, Vinita Davey ‘17, thought of Houston and his inspiring story. They set the gears in motion to have him introduce Barack Obama. “They enabled me to have that amazing opportunity,” Patrick said. “It was a crazy couple of days because there was a ton of information to get together and a lot of work went into this process. My role was really a very small role of facilitator/connector,” Urban wrote in an email. Houston wrote a brief statement about himself to be sent to the White House. After this, he was asked to send over a fluid narrative about his life, which was read and hand-picked by Barack Obama. The rest is history. Houston wrote the speech Sunday night, and the White House made edits Monday morning. Houston made further and final edits Monday night after receiving word that he needed to cut the speech down. “I ended up rushing through final edits of a speech to introduce Barack Obama as if I were finishing a small high school term paper assignment,” Houston said. He delivered his speech at the rally in front of the Philadelphia Museum of Art, touching on the influence of Obamacare in his life. He was not nervous as he stood at the podium. “It was my chance to pay tribute to all these people. There’s no space to be nervous; this is too great of an opportunity. That really empowered me.” Houston said. When Patrick mentioned Swarthmore College, a crowd of Swarthmore students in the crowd burst into cheers. Associate Professors Benjamin Berger and Keith Reeves were in the crowd. “I was overwhelmed with both pride and humility: pride for Patrick, humility for myself […] Patrick’s story reminds us faculty why we do what we do. It should remind us citizens what remains to do together,” wrote Ben Berger in an email. “It was extremely humbling to have that opportunity, rare opportunity, that once in a lifetime opportunity,” wrote Patrick.